Buying a good mattress is essential to getting a good night’s sleep. A good night’s sleep is dependent on several factors, but one of the most important is having a supportive, comfortable mattress. Not everyone wants the same kind of mattress or the same degree of support, but the best mattresses of 2019 have a few things in common. They all are backed by a good warranty, they all offer good support and they are all constructed well, with strong seams and materials that should withstand at least ten years of nightly use. There are three main styles of mattress available – innerspring, memory foam or a combination of the two (often referred to as a hybrid mattress). Which type is best is open for debate, and preferences vary from person to person. 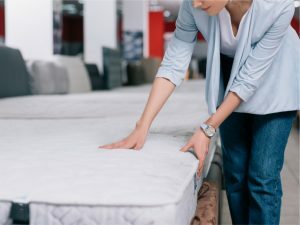 To make mattress shopping a bit easier, the best of all three styles for 2019 have been ranked and reviewed below. The Nectar mattress consistently outperforms many other brands. It is a memory foam mattress offering plenty of support while cradling your body without pressure points. It has enough firmness to accommodate those with back issues while providing sleepers a feeling of being cradled in comfort. The cover is Tencel with a layer of gel memory foam for excellent air circulation and to keep you cool even when it is hot outside. The foundation of the mattress has two layers of foam for extra support. The mattress is CertiPUR-US®, meaning it does not have ozone depleters, TCCPP, mercury, lead or PBDEs. It comes with a one year guarantee. If you do not like it, you can get a full refund in the first year. Layla manufactures a great memory foam mattress featuring five distinct layers of foam, each with its own function to keep you cool and comfortable while giving your spine plenty of support. Layla also offers two different levels of firmness, which is unusual in a memory foam mattress. One side of the mattress is plusher while the other side gives you more firmness. This way you do not have to choose and try two different mattresses. You just flip it over for the best sleep for you. The top and bottom layers of foam are infused with copper, which is naturally antimicrobial and heat conductive. The mattress pulls excess body heat away from you and kills bacteria. Copper also enhances the support the mattress provides to ensure proper spinal alignment. For those who love the traditional innerspring mattress, Saatva makes a luxurious, pillow-top mattress with a thin layer of foam. The pillow top gives you cushiony comfort backed by firm support. Each mattress is individually made so it does take a while to get one, but you will love the mattress when it arrives or you get a full refund within 120 days. You can choose between Plush Soft, Luxury Firm or Firm to get the best firmness level for your comfort. All materials are allergen-free and eco-friendly with recycled materials and organic cotton coverings. Densified foam layering in the middle third of the mattress gives sleepers extra lumbar support. For a truly luxurious hybrid bed, try Nest Bedding’s Alexander Signature Hybrid. Each mattress has five layers, including eight inches pocketed coils topped with three separate layers of foam. The top layer is a gel foam to keep you cool even in the hottest weather. The center layer is infused with copper, which is antimicrobial and also helps with regulation of body temperature so you do not overheat. The innerspring foundation assures you get plenty of support and has strong edges to prevent you from rolling off the bed. Little extras like handles on the sides and a soft, polyester/cotton blend cover with a satiny touch are nice touches elevating the quality of the mattress. You can order it in Plush, Medium and Luxury Firm depending on the type of support you want. If you are a back or stomach sleeper, the Alexander Signature Hybrid is an excellent choice. The individually wrapped coils minimize the motion transfer usually found in innerspring mattresses. This mattress is the best of both worlds. The Bear hybrid is truly a hybrid with innerspring coils topped with two layers of foam thick enough to give you the true memory foam experience and air circulation to keep you cool in warm weather. The mattress uses Celliant® technology, which provides better regulation of body temperature, improves your recovery time after exertion and improves oxygen levels in the body. If you are an athlete, this is the best mattress you will find. Bear hybrid mattresses offer a 100 night free trial. You get a full refund if you are not satisfied with the mattress, including pick up. For athletes and other active individuals who prefer full memory foam without an innerspring foundation, Bear also offers a memory foam mattress featuring a high-density foam base topped with three additional foam layers for responsive recovery, cooling and pressure-point relief. It also has the breathable Celliant® cover for quick body recovery after exertion. Nolah manufactures an environmentally friendly, high quality mattress topped with an air foam layer rather than memory foam. It features the brand’s proprietary AirFoam technology offering firm support without the warmth of memory foam. It claims to be four times more effective at preventing pressure points. It comes in an upgraded version you can flip over for more support on one side. The top layer of air foam keeps you cooler than traditional memory foam. The mattress is covered in all-natural, breathable viscose. Nolah mattresses are CertiPUR-US® certified, guaranteed to be made from materials that do not deplete ozone and do not contain formaldehyde or heavy metals. It comes rolled up, like most memory foam mattresses, but it only takes about an hour to expand, unlike traditional memory foam that can take up to 24 hours before you can sleep on it. There is a 120 day, risk-free trial period when your mattress is delivered.